Impacted Wisdom Tooth – Diagnosis, Treatment and Recovery! Impacted Wisdom Teeth (or often referred to as impacted 3rd molars) are the wisdom teeth in the back of the mouth that do not fully erupt typically because of blockage from other teeth. 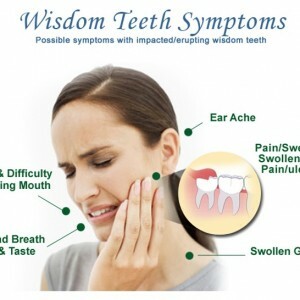 Many adults can go their entire life without experiencing any discomfort from their wisdom teeth whatsoever. In many cases however, the inability for the tooth to erupt properly can develop into a serious problem often causing a great deal of pain, inflammation and even infections. 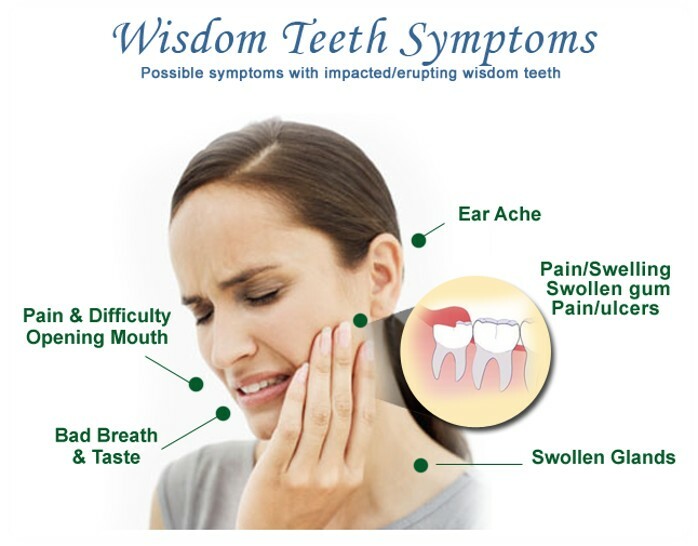 When this occurs, the impacted wisdom tooth has to be extracted. Wisdom teeth are the 3rd set of molars (the very last tooth) in the back of the mouth. In most cases, patients have one wisdom tooth per quadrant with a total of 4 per mouth. Wisdom teeth generally erupt between the ages of 17-25 and often cause problems because they affect other teeth, or many times grow in sideways. What does it mean when your wisdom teeth are impacted? When a wisdom tooth is impacted, it means that there is generally not enough space for the tooth to erupt properly through the gums into the mouth. There are several reasons for this including that there might not be enough space for the tooth in the jaw. It can also be because other teeth are blocking it from erupting properly, or because it is growing in the wrong direction. Must your wisdom teeth be pulled out? If your wisdom teeth have grown in correctly and are not causing you any pain or discomfort, it is not necessary to have them removed. At iSmile Dental, we recommend having them extracted only if they are impacted and cause crowding in your teeth which can lead to other dental related issues in the future. At iSmile Dental, the relative ease at which our doctors can remove your wisdom tooth depends on several factors including positioning of the tooth and stage of development. A wisdom tooth that is fully extracted through the gum can be removed relatively as easily as any other tooth. However, if the wisdom tooth is underneath he gum and embedded into the jawbone, an incision is required into the gum and the portion of the bone that lies over the tooth is also removed. In cases like these, the extraction is done in sections rather than removing the tooth at once to minimize the bone that needs to be removed to get the tooth out. What happens during the wisdom tooth removal? Before your wisdom tooth is removed, the teeth and the surround tissue are numbed with a local anesthetic; the same type used for filling a cavity. At iSmile Dental, we also offer nitrous oxide (laughing gas) to ease anxiety if a patient is feeling particularly nervous about the procedure. The tooth is then removed as described above and the patient is usually allowed to go home unassisted. What is Recovery like after my wisdom tooth is pulled? Bleeding: Bleeding may occur for several hours after the extraction. This is perfectly normal and you should not panic. We advise taking a clean moist gauze over the socket where the tooth was removed and bite down firmly. Continue biting for approximately 45 minutes. If have bleeding persists, you can contact your dentist for additional information. Avoid spitting or sucking through a straw for 24 hours after your extraction. Do not smoke. Also avoiding hot liquids (coffee, tea, soup). These slow down the healing process. Facial Swelling: Facial swelling in the area where the tooth was extracted from is normal. In the first 24 hour period, we advise our patients at iSmile Dental to apply ice (wrapped in a cloth) over the area for 10 minutes then remove for the ice for 20 minutes. This should be done with consistency throughout the day. Pain Medications: Tylenol (Acetaminophen) or Advil and Motrin (Ibuprofen) can be taken for minor pain. Dentists or Oral Surgeons often prescribed stronger pain relievers if necessary. Foods: Typically, we recommend iSmile Dental patients to be on a liquid diet until all the numbness and anesthesia wears off. Eat soft foods for a few days and avoid alcohol. Brushing: Continue brushing your teeth but avoid the teeth close the extraction site in the first 24 hours. Afterward, brush gently with a soft toothbrush around the area. Also avoid commercial mouth rinses as they might irritate the extraction site. At iSmile Dental, we have years of experience diagnosing and treating wisdom tooth related issues. Have a question? Experiencing discomfort or pain? Need to know what do next? Call us today, our professionals are knowledgeable and experienced and can steer your in the right direction.